Tamara Draut, the Vice President of Policy and Research at Demos, published her latest book, “Sleeping Giant: How America’s New Working Class Will Transform America,” this spring. Draut delves into not just the struggles facing working families, but the incredible power and potential of our new working class to change our economic and political future for the benefit of all of us. 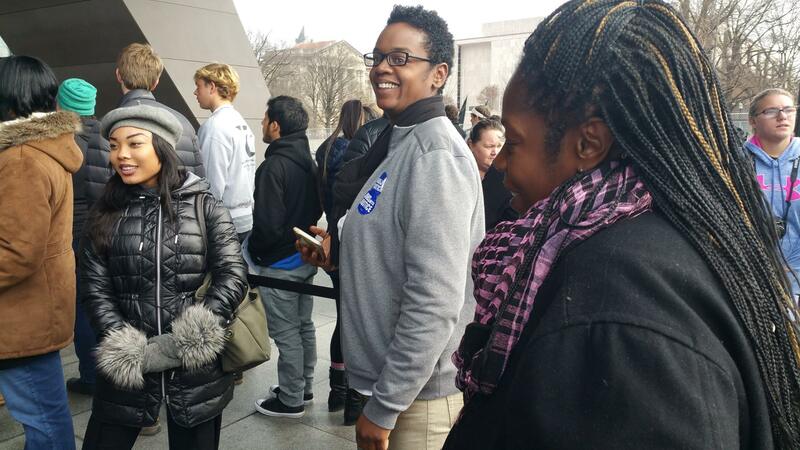 The book features interviews with a number of organizers who are at the frontlines of the fight for racial, gender and economic equality, including Ashli Bolden of Missouri Jobs With Justice. 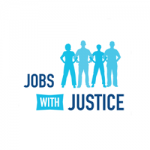 In April, Jobs With Justice Executive Director Sarita Gupta spoke alongside U.S. Sen. Elizabeth Warren (D-MA), Washington Post reporter Janell Ross and AFL-CIO Executive Vice President Tefere Gebre at a release event for the book. You can read an excerpt of “Sleeping Giant” below, edited for length. My father died a few short months after the city of Detroit declared bankruptcy. He was a steel worker. He was America’s hero, the backbone of a middle class the likes of which the world had never seen. Men who secured America’s industrial might in the world earned the pride and respect of our nation. That working class is dead, but the working class is not. It’s just different. No longer in a factory, today’s working class is interwoven into nearly every aspect of our lives. It’s the caretaker, the man in a uniform (which he had to pay for) who restocks shelves of a big box giant, the home health care aide who cares for your mom and the janitor who empties your wastebasket. Yet, despite how interwoven this new working class is in our lives, we don’t know enough about them. They don’t shape the national agenda or headlines in newspapers. “Working class” is scrubbed from our social and political lexicon, rendering millions of workers straddling poverty invisible. And yet, all of our lives would grind to a halt if the working class waged a general strike. Their sheer scale in size and diverse demographics will shape the future of American politics. Our nation’s prosperity will be defined by whether we address their declining living standards. 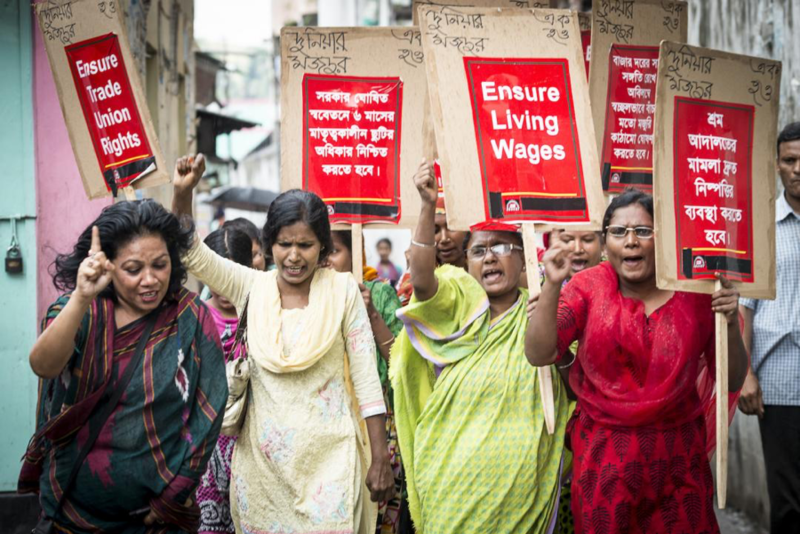 In the spring of 2013 this new working class introduced itself to the world with coordinated walk-outs of fast food workers in major cities across the country. The old blue-collar nation typically paid its workers hourly wages of $17 or more an hour. 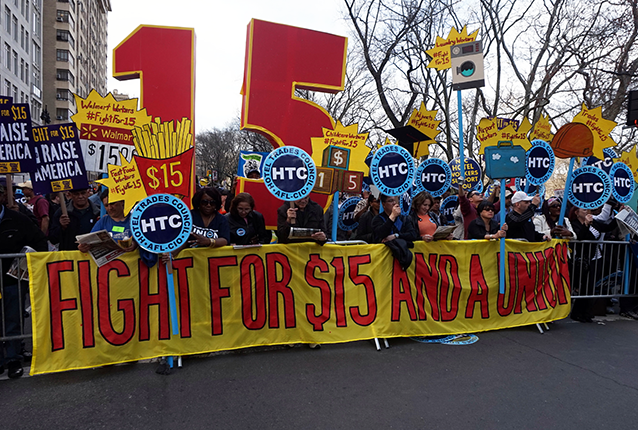 The fast-food workers—one of the largest jobs in America today—were protesting wages that hover around $8 an hour. What began as a movement among fast-food workers has since mushroomed into a major worker justice movement known as The Fight for $15, where home workers, airport workers, adjunct professors and fast-food workers all come together to fight for better wages and working conditions. They are a Sleeping Giant fertilizing the seeds of a new working class solidarity. In just a few years, The Fight for $15 can claim significant victories, from consciousness-raising to policy changes in red states and blue states. In the 2014 elections, voters in Alaska, Arkansas, Nebraska and South Dakota passed ballot measures to raise their states’ minimum wage. Voters in San Francisco approved a $15 minimum wage increase, matching Seattle’s groundbreaking increase. The movement lifts up the needs and struggles of working-class people who aren’t engaged directly in the growing chorus of workers taking to the streets. I’ve interviewed workers all across this country. One of the most common grievances expressed was the lack of respect they experience in the workplace and in society more broadly. Whatever their job, the individuals I talked to described their work as meaningful and embedded with purpose, yet they also told me about the disrespect they get on the job from their bosses and politicians. For LaShawn and Michelle, who in many ways typify the new working class, their work is deeply gratifying. The African American couple, both in their late 30s, have been married for 12 years and live on the outskirts of Atlanta. LaShawn is a commercial sanitation driver, emptying dumpsters for $16.10 an hour. Michelle is a certified nursing assistant (CNA), providing care for the elderly in their homes. She now works as a supervisor, earning $9 an hour for overseeing a staff of CNAs, ensuring each client receives the best possible care. They both grew up in Atlanta, and now raise their children there. They both love their jobs. Driving a garbage truck is a childhood dream come true for LaShawn, who always had a passion for trucks and sees his job “as getting to play with this big machine and getting paid for it.” Yet his pride finds little reciprocation from management. In LaShawn’s case, workers are often clocked out by management to avoid paying overtime, even though they’re still working—a practice known as wage theft that is increasingly common in today’s working class jobs. To get close to 40 hours, Michelle used to work 7-days a week, a pace she maintained for three and half years before taking her current position. LaShawn also mentioned that he’d like to have the money to treat his kids and wife to a dinner out, or a night at the movies. But LaShawn doesn’t think our nation’s elected officials are much concerned about his family’s dreams and struggles. “It feels like the working class are the lepers of society. Needed to carry out the economy, to hold it and make it strong, but disregarded when it comes to our needs,” he told me. Gone are the pensions, health insurance coverage and paid vacations that characterized the working class jobs of the industrial era. Today’s service-sector serfs are fighting for the most basic of job perks: a decent paycheck, a stable schedule with enough hours, and paid time-off when they or their children are sick. New working class jobs no longer provide a livelihood. Let that sink in. A job no longer provides a livelihood for the working class. No matter how you define working class—as individuals without bachelor’s degrees, as people who get paid by the hour, or as workers who aren’t managers or supervisors—their numbers constitute the majority of American workers and even American adults.